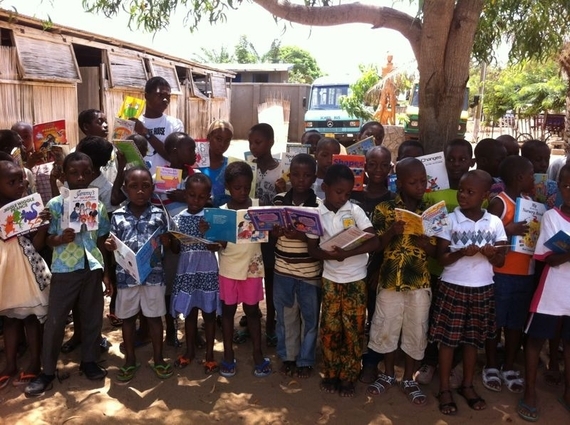 We are very happy to report that nearly 3,000 books for the Bright Future School in Keta, Ghana have been successfully delivered and were happily received by the students there earlier this month! Keith Goddard at Books Matter posted a short video on Facebook of the students saying “thank you,” so check that out if you can (it’s almost guaranteed to make you smile!). Keith reports that the school was actually on break when the books arrived, so there will be more pictures of the students with the books soon. Earlier this month, another hundred books were presented to the library of the University of Health and Allied Sciences: Ghana TV was even on hand for the arrival of the books! All of the books sent to Ghana this spring are cataloged on LibraryThing in the Books Matter account, and members have been helping out by adding tags to the library. Keith is planning on sending the next batch of already-donated books to an orphanage in Kumasi, located in northern Ghana. The orphanage houses some two hundred residents ranging in age from six months to 20 years. The books will be cataloged and tagged on LibraryThing prior to shipment. If you can help out by making a donation to help ship the books, it would be greatly appreciated! A gift of $1 basically funds the shipment of one book to Ghana, so every little bit helps! Head over to the Books Matter site and you can make a donation today. LibraryThing will be giving a $800 donation as well, from the funds raised by members adding events to LibraryThing Local over the winter. For more on our Books to Ghana project and our partner Books Matter, see our announcement blog post. To help out with tagging the books or to discuss the project generally, chime in on the Talk thread. So, just wondering, is this is where the “LibraryThing Local’s Helpers” balance is going to go? Currently book donations are being handled through Books Matter – you can contact them via http://booksmatter.org/contact (we may as the project move forward have other methods for handling donations of books, but don’t at the moment).